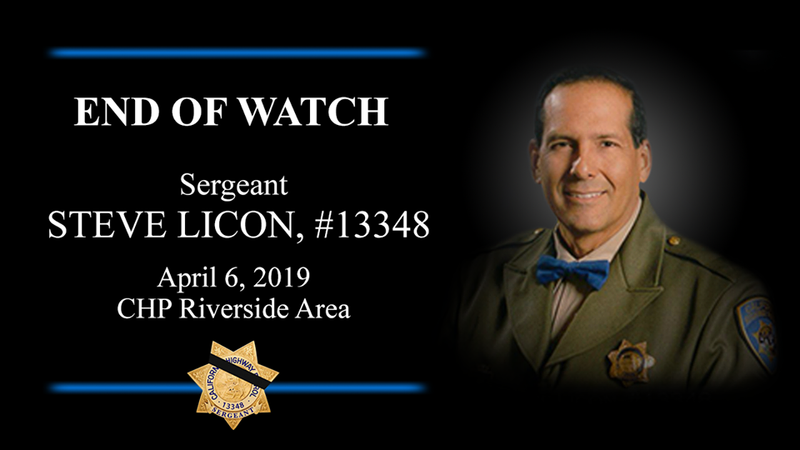 Steve Licon a 27-year veteran of the California Highway Patrol was struck and killed by a suspected DUI driver on April 6. SACRAMENTO—A California Highway Patrol Officer was struck and killed by a sedan on the 15 Freeway on Saturday, April 6 outside of Lake Elsinore by a suspected DUI driver, the Inland California Highway Patrol indicated in a statement. According to the CHP, the crash occurred at approximately 4:26 p.m. and the officer was airlifted to a local hospital. The California Highway Patrol conducted a traditional ceremony for the motorcycle officer. CHP Commissioner Warren Stanley announced end-of-watch for Sergeant Steve Licon on Monday, April 8 at the CHP Academy in West Sacramento. Licon was a 27-year veteran with the department. “With heavy hearts we gathered together at the CHP Academy today for a Bell Toll Tribute in honor of a hero was sacrificed his life for the Safety, Service, and Security of others,” tweeted the CHP Headquarters. “Motor Sergeant Steve Licon was killed in the line of duty Saturday, April 6, 2019. Michael Callahan, 36, of Winchester was arrested and booked on multiple charges including murder and suspicion of driving under the influence. Callahan is suspected of crashing into Licon and a car the CHP Officer pulled over for speeding. Licon died at a nearby hospital. The family of four in the other individual that Licon pulled over were not injured during the incident. The crash closed all lanes on I-15 in Lake Elsinore to motorists. The freeway reopened on Sunday, April 7. The CHP posted the following statement on Facebook in response to Licon’s passing. Inmate records show that Callahan has a court appearance set for Wednesday, April 10. Investigators believe that the recommendation of a murder charge in the case is “completely appropriate,” said Mario Lucio, special services commander of CHP’s inland division.